Our library houses approximately 13,000 books, eBooks, videos, and magazines to support our curriculum and students’ reading needs. Along with our print materials, we subscribe to multiple databases and eBook reference collections to ensure that our students have access to information online that directly supports our school’s curriculum. 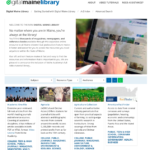 The Digital Maine Library collection of databases, offered through the state of Maine, is free to all Maine residents and offers users from pre-school through college, high-quality information. We suggest that all families take a few minutes to preview this outstanding collection of information resources. Ready to use the Internet to locate information? Consider using one of these databases or websites first! Digital Maine Library hosts online reference resources, magazines, newspapers, journals, from the world’s most reliable sources. This collection is open to everyone in the state. Gale Virtual Reference Library offers our students 100 outstanding eBook reference titles in over 450 volumes. Contact the JFD Library if you need the password. American History Online contains information on individuals, topics and events from the Colonial era to the present. Contact the JFD Library if you need the username and password. CultureGrams presents information on more than 200 countries, the United States, and Canada. Contact the JFD Library if you need the username and password. Maps101.com contains more than 4,000 viewable and printable history, thematic, reference, outline, current events and animated maps. Contact the JFD Library if you need the username and password. Learn360 Multimedia platform for teachers and students. Contact the JFD Library if you need the username and password.